BPL 2019 Khulna Titans vs Rajshahi Kings Match 8 Live Cricket Streaming And Updates: Khulna Titans and Rajshahi Kings will lock horns in match 8 of the Bangladesh Premier League 2019 on January 9, Wednesday at the Shere-E-Bangla stadium. Mahmudullah-led Titans have lost of their opening matches and will be confident to register their first victory against a little inexperienced Rajshahi Kings, who were thrashed by 83 runs in their campaign opener against Dhaka Dynamites. Though, Mohammad Hafeez, Soumya Sarkar, and Mustafizur Rahman are the most dependable as well as match-winning players for young Mehidy Hasan-led Rajshahi kings. Meanwhile, in the previous game, Carlos Brathwaite was dropped in place of David Wies, who proved his worth to stay in the team and might be seen playing in today’s game as he might play the major role to register Titans’ first-ever win of the tournament. What time does the Khulna Titans vs Rajshahi Kings match in the BPL 2019 starts? The Khulna Titans vs Rajshahi Kings match in the BPL 2019 starts at 04:50 PM IST, January 9 (Wednesday). Where is the Khulna Titans vs Rajshahi Kings match in the BPL 2019 being played? 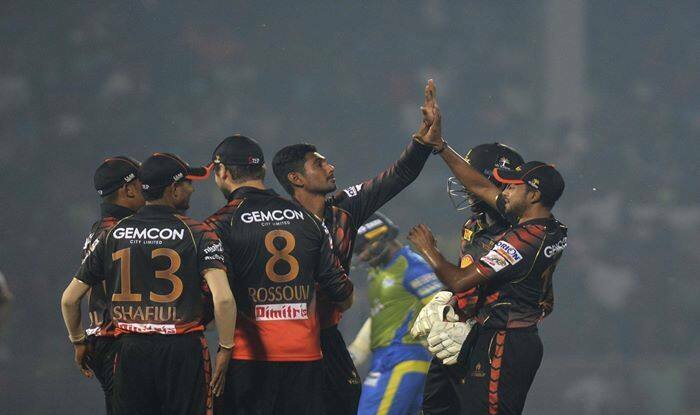 The Khulna Titans vs Rajshahi Kings match will be played at the Shere-E-Bangla Stadium, Dhaka. Which TV channels will live broadcast (in India) the Khulna Titans vs Rajshahi Kings match in the BPL 2019? The Khulna Titans vs Rajshahi Kings match in the BPL 2019 will be live broadcast on DSport in India. How to watch the free online live streaming of the Khulna Titans vs Rajshahi Kings match in the BPL 2019? The free online live streaming of the Khulna Titans vs Rajshahi Kings match in the BPL 2019 will be available Youtube. What are the probable playing XIs of Khulna Titans vs Rajshahi Kings match in the BPL 2019? Khulna Titans: Paul Stirling, Junaid Siddiqui, Nazmul Hossain Shanto, Mahmudullah (c), Ariful Haque, David Wiese, Jahurul Islam (wk), Taijul Islam, Shoriful Islam, Zahir Khan, Ali Khan. Rajshahi Kings: Mohammad Hafeez, Mominul Haque, Soumya Sarkar, Laurie Evans, Zakir Hasan (wk), Ryan ten Doeschate, Mehidy Hasan (c), Alauddin Babu, Qais Ahmed, Arafat Sunny, Mustafizur Rahman.